Pilon, Roch. "Clara Hughes". The Canadian Encyclopedia, 28 May 2018, Historica Canada. https://www.thecanadianencyclopedia.ca/en/article/clara-hughes. Accessed 20 April 2019. Clara Hughes, OC, cyclist, speed skater, humanitarian (born 27 September 1972 in Winnipeg, MB). Clara Hughes is the only Canadian athlete to have won medals at both the Olympic Summer and Olympic Winter Games, winning two medals in cycling and four medals in speed skating. Speed skater Clara Hughes following her gold medal performance in the 5000m event. Hughes is the first Canadian to win a medal in both the Summer and Winter Olympic Games (courtesy CP Archives). 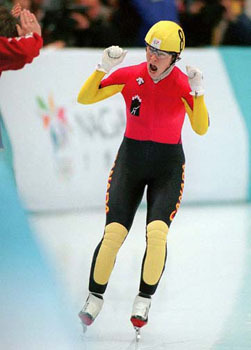 Clara Hughes celebrates her bronze medal performance in the women's 5,000 metre long track speed skating race at the Winter Olympics in Salt Lake City, Utah (23 Feb 2002). Clara Hughes, OC, cyclist, speed skater, humanitarian (born 27 September 1972 in Winnipeg, MB). Clara Hughes is the only Canadian athlete to have won medals at both the Olympic Summer and Olympic Winter Games, winning two medals in cycling and four medals in speed skating. She and fellow speed skater Cindy Klassen have six Olympic medals each, the most of any Canadian athlete. Hughes has won a combined total of 35 national championships in road cycling, track cycling, and speed skating; she has also won eight medals in cycling at the Pan American Games and three medals in cycling at the Commonwealth Games. Hughes is an Athlete Ambassador with Right to Play and in 2012 joined the organization’s International Board of Directors; she is also the National Spokesperson for the Bell Let’s Talk campaign for mental health awareness. Inspired by Gaétan Boucher's success in the 1984 Olympic Winter Games, and by the 1988 Olympic Winter Games in Calgary, Hughes took up speed skating at 16 and won a junior national title in the 3,000m. She skated competitively for two years and started cycling in 1990 as a means of cross-training for the winter sport. At that time Andrea Auch (sister of Susan Auch, two-time Olympic 500m speed skating silver medallist) was working for a cycling association and told officials about Hughes's tremendous potential as a cyclist. After some deliberation, Hughes decided to leave skating to become an Olympic cyclist. During the 1990s, Hughes established herself as a major force in the world of cycling. In 1991, she won a silver medal at the PAN AMERICAN GAMES and became a member of the Canadian National Cycling Team. She won a silver medal at the 1995 World Cycling Championships, and silver and bronze medals at the 1995 Pan American Games. She also competed in four Tours de France Féminins, and won multiple Canadian championships. Hughes continued to cycle after resuming speed skating, competing in numerous races for her professional team, Saturn, and in 2003 she won gold, silver and bronze medals at the Pan American Games. In 2010, at the age of 38, she announced her comeback to international cycling competition, later qualifying for a spot on the Olympic team destined for the 2012 Summer Olympics in London where she participated in the 140 km Women's Road Race. She finished 32nd in a field of 66 competitors, having spent much of the race near or at the front of the peloton on a rain-soaked and crowded course. 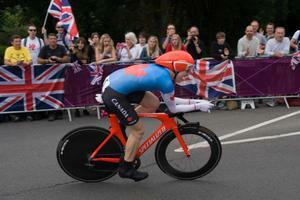 Hughes also placed an impressive fifth in the road time trial at the Olympics. She later revealed that she had been competing with the lingering effects of a back injury that she had incurred in a crash during the nationals in Gatineau, Québec, the previous May. Hughes returned to her first love, speed skating, in 2000, after a break of 10 years. 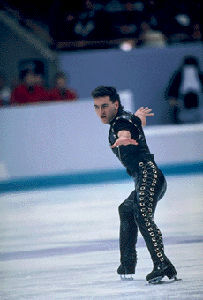 After training for only seven weeks, Hughes made the national speed skating team and qualified for three World Cup events in 2001. In November 2001, she placed fifth in the 5,000m at the World Cup in The Hague. Shortly after, in December 2001, she finished second in the 3,000m at the Olympic qualifying meet in Calgary. These accomplishments earned her a spot on the 2002 Canadian Olympic speed skating team. Hughes made Canadian and Olympic history at the Salt Lake Olympic Winter Games in 2002. Her bronze medal in the women's 5,000 m speed skating event made her the first Canadian athlete, and only the fourth since 1896 (joining Eddie Eagan of the United States, Jacob Tullin Thams of Norway and Christa Rothenburger-Luding of East Germany), to win a medal in both the Olympic Summer Games and the Olympic Winter Games. 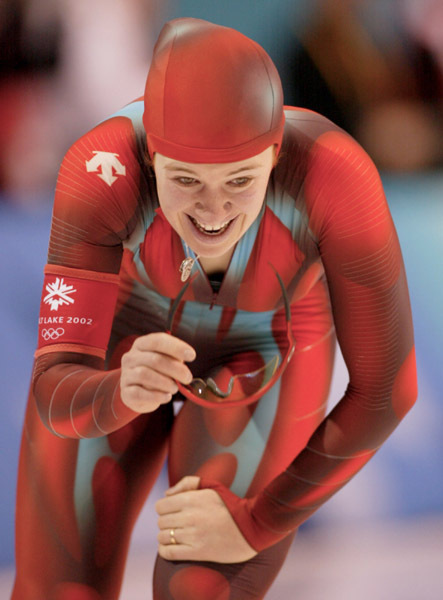 At the Torino Winter Olympics in 2006, Hughes won gold in the 5,000m event and silver in the team pursuit. In 2010, Hughes was chosen by the Canadian Olympic Committee to carry Canada's flag at the opening ceremony of the Vancouver Olympic Winter Games. She won bronze in the 5,000m competition, the last speed skating race of her career. In addition to her record-setting athletic career, Hughes is well-known for her advocacy and humanitarianism. She is an Athlete Ambassador for the Right to Play organization, and in 2012 joined its International Board of Directors. She also supports other not-for-profit initiatives including the Nunavik Youth Hockey Development Program, Take a Hike (an alternative education program for at-risk youth), and the Axel Merckx Youth Development Foundation, which supports young cyclists in Canada. In 2010, Hughes became the national spokesperson for the BellLet’s Talk campaign for mental health. Known almost as much for her smile and sunny disposition as for her athletic accomplishments, Hughes has shared her struggle with depression in order to help dispel the stigma associated with mental illness and promote dialogue about mental health. Hughes has been widely recognized for her contribution to sport. In 2006, she was awarded the International Olympic Committee's Sport and the Community Award. In 2010, she was inducted into Canada’s Sports Hall of Fame and received a star on Canada's Walk of Fame. She has received honorary doctorates from the University of New Brunswick, University of Manitoba and University of British Columbia. She is also an Officer of the Order of Canada and a Member of the Order of Manitoba. A number of places have been named in her honour, including a park and community centre in Winnipeg, MB, and Sydenham Hill (nicknamed “Clara’s Climb”) in Dundas, part of the city of Hamilton, ON, where Hughes trained for seven years. Bell Let’s TalkCheck out the website for Bell Let’s Talk, the multi-year charitable program dedicated to effective management of mental health issues. Clara HughesThe website for Canadian athlete Clara Hughes, six-time Olympic medalist in cycling and speed skating.